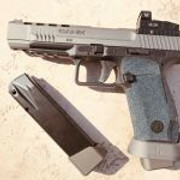 Canik Firearm Reviews and Range Reports. Share your Canik experiences with other members. Slide still locks back whenever it feels like it. Finally got around to zeroing the Viper with success. The Taylor Freelance +4 mag extensions with factory springs and flared magwell operate flawlessly. 124 grain CCI. 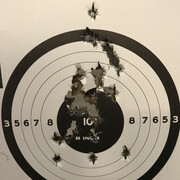 Pic was rapid fire at 25 yards. Can't wait to start shooting matches. Slide still locks back whenever it feels like it. Can't wait to start shooting matches. So the slide will lock back randomly with rounds in the mag? How often does that happen? With the magwell...you planning to run "Open Class"? Apologies. After emptying a magazine the slide sometimes locks to the rear after the last round. After talking with some local shooters I think open class is what I'll have to run with my magwell. I haven't competed since 2004-2006 and that was with factory stock guns (gulp, 14 years ago), so I'm approaching it like I'm a newb.